It’s no secret my girls have special needs. You can easily see the facial characteristics of Down syndrome, or the walker, wheelchair, and poor gait that points to cerebral palsy. Delays, poor speech, clumsy steps. I know you see the behaviors. I know you hear the labored words. I know you notice the differences and I know you are grateful this is not your child. I don’t blame you. I understand. Sometimes it’s hard. There was a time I stood where you stand now, from the outside looking in. But I wish you could see what I see. 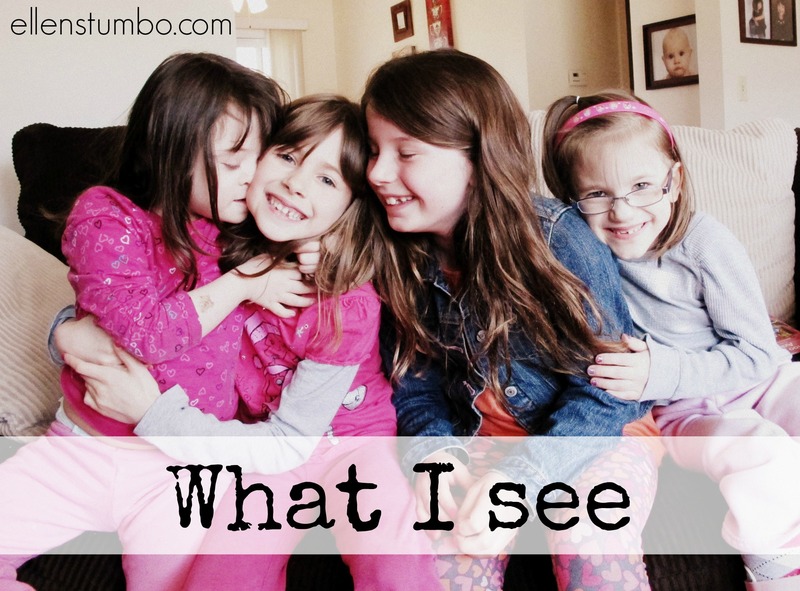 Because my kids are so much more than what your eyes perceive. Our lives are rich and full. I wish you could see the celebration we live with, the excitement we find in the small accomplishments, and the way we cheer each other up. I wish you could see the beauty of looking beyond a disability to see the person, just the person. The beauty not only from the outside, but the incredible beauty that’s found in the heart. I wish you could see the joy, not just happiness, but the overwhelming joy. I wish you could see the smiles that knock me over feeling like the luckiest parent in this world. The laughs that make me do crazy theatrics just to hear those giggles. I wish you could recognize that those clumsy steps mean mobility, and every single step is a win. I wish you could see the sibling love, so different from what I expected. So real, so close. So beyond my dreams. I wish you could see how typical our lives are. Sibling fights, trips to the park, grilling burgers in the backyard. I wish you could see the old me, and recognize how my kids have helped make me into who I am today. How they have helped me rearrange my priorities, and how they have made me stronger, bolder. I wish you could see our thankfulness, and how very lucky we feel that we get to call these kids our very own. I wish you could recognize the sweet sound of those labored words, and how hearing, “I love you,” even with missing sounds, is beautiful. I wish you could see our Friday family movie nights, and how much love you can feel in a living room, eating chicken nuggets and French fries. I wish you could see that we love our life, our family, and how well we fit together — all of us flawed in our own way, all of us loved for exactly who we are. Yes, I wish you could see the love. And I wish you could feel it too. It’s the type of love that surprises you, because you never thought you could love this way. Love changes things, even perspectives. I know it changed mine. I wish you could see what I see. A version of this post originally appeared on Ellen Stumbo’s site. The Mighty is asking its readers the following: If you could go back to the day you (or a loved one) got a diagnosis, what would you tell yourself? If you’d like to participate, please send a blog post to [email protected] Please include a photo for the piece, a photo of yourself and 1-2 sentence bio. Ellen Stumbo is the Parenting Editor at The Mighty. She is also the founder of Disability Matters, an organization with the mission to encourage every church to embrace disability. Ellen is a national speaker who focuses on issues pertaining adoption, faith, disability and parenting kids with disabilities. Ellen writes for several online platforms including Focus on the Family, LifeWay, MomSense, Not Alone, Mamapedia, Group, The Mighty and the Huffington Post. Ellen blogs at ellenstumbo.com and you can also find her on Twitter and Facebook.